A dozen people were arrested Monday following an anti-violence demonstration that had planned to shut down a part of the Kennedy Expressway near O'Hare, Illinois State Police say. 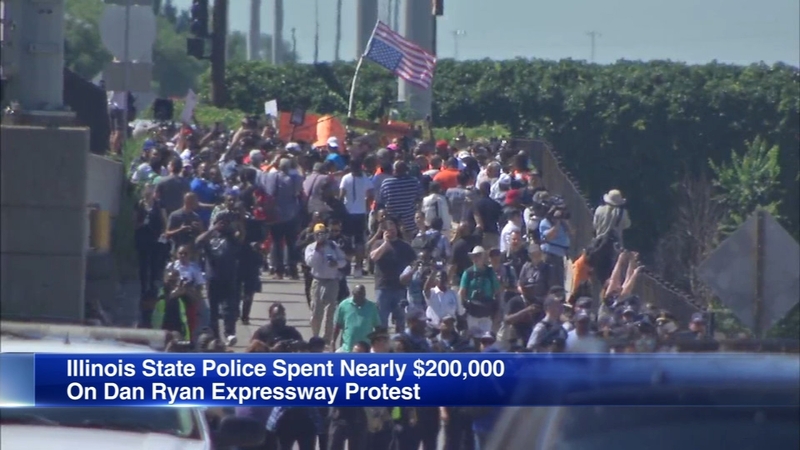 CHICAGO (WLS) -- A dozen people were arrested Monday following an anti-violence demonstration that had planned to shut down a part of the Kennedy Expressway near O'Hare, Illinois State Police say. Police say those arrested were cited for obstructing a roadway and fined $120. Most were released right away. According to a campaign representative, Willie Wilson plans to bail out any protesters who remain in jail. Protesters started gathering at Cumberland and the Kennedy Expressway, but they were not allowed on the expressway. Police warned demonstrators that anyone who attempted to enter the expressway would be arrested. The crowds weren't as big and the disruptions not as intense, but marchers answered Rev. Gregory Livingston's call to impede traffic to O'Hare Airport to draw attention to Chicago's violence problems especially on the South and West sides were heard. Illinois State Police troopers blocked anti-violence demonstrators from marching onto the Kennedy Expressway near O'Hare Airport Monday afternoon. "I need you all to remain peaceful, don't disturb them, because guess what? We've already achieved our goal. I want to thank all of you that came out. This is not the end," said Rev. Livingston as he was met by police near the Kennedy entrance ramp. Shortly thereafter, he was arrested. There were about 40 to 60 protestors according to police. They were met by those from neighboring precincts of Park Ridge and Chicago who made it clear where their sympathies lay. After being rebuffed from the expressway, some marchers carried on parallel to it, headed to the CTA Cumberland station. Some from the other side attempted to commandeer their message. "As far as that moment, it was very respectful. I don't know if you could tell from a distance, but within the area where we were standing, it was very respectful. Our officers and every officer involved here has been professional and respectful throughout this event," said Major David Byrd with the Illinois State Police. Chicago Police Department spokesperson Anthony Guglielmi said approximately 40 to 60 people participated in the demonstration. "The safety of the public is our number one concern. We will enforce the law to keep the public, the protesters, motorists and public safety personnel safe," said Illinois State Police (ISP) Director Leo P. Schmitz in a statement. "The ISP is committed to stopping the violence in the state of Illinois and we fully support the First Amendment right to peacefully assemble, so long as it does not put the safety of the public in peril." The Coalition for a New Chicago planned to shut down the Kennedy Expressway then march to O'Hare in part to put pressure on Mayor Rahm Emanuel. They had gathered at designated area near Cumberland and the Kennedy Expressway. There was a very large police presence and authorities said it was a coordinated effort between the city of Chicago, Park Ridge police and the Illinois State Police. "We can never allow an airport to be shut down. There's federal implications, there's federal charges involved for anybody that would try to obstruct commerce at an airport or people coming and going. We have a holiday weekend in place. We're not going to let the airport get shut down," said Chicago Police Deputy Superintendent Anthony Riccio. An anti-violence demonstration scheduled for Monday planned to shut down a part of the Kennedy Expressway aiming to disrupt traffic to O'Hare International Airport. Protesters said their goal was to block both sides of the Kennedy and inconvenience people so that their group would be heard. Mayor Emanuel has said in the past that people in the city rely on O'Hare and Midway for economic and job opportunities, so he believes the message shouldn't be sent in a way that would disturb their livelihoods. "In order to get the attention and the ears that we need for the people's needs we have to perform some kind of massive action," said Rev. Gregory Livingston, the president of the Coalition for a New Chicago. The group organized by Rev. Livingston was sending a message to Mayor Rahm Emanuel and demanding better job opportunities and schools for those living on the city's South and West sides. They also want a face-to-face meeting with the mayor. "Rahm is inaccessible, and not a people person. He runs from the people and we're just gonna chase him until we get him as long as he's getting a pay check, because that's the taxpayer's money," Livingston said. Livingston's Coalition is one of the groups behind last month's Lake Shore Drive shut down and march to Wrigley. "The city of Chicago, the Illinois State Police and Park Ridge all have significant resources to dissuade people from going on to the expressway and hopefully it won't come to the point where there would be arrests," said Park Ridge Police Deputy Chief of Operations Duane Mellema. Meanwhile, some residents didn't believe this was the way to send a message. "The mayor is doing all his best trying to fix the problem that we have, which is the violence. And trying to create traffic and inconvenience everybody using the Kennedy I think doesn't help the cause," said area resident Mohammed Abukar. An anti-violence demonstration scheduled for Monday plans to shut down a part of the Kennedy Expressway aiming to disrupt traffic to O'Hare International Airport.